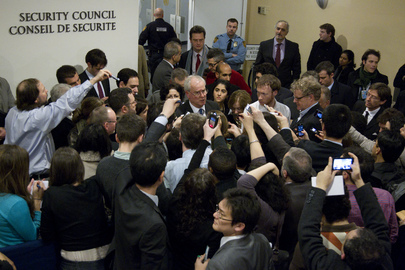 UNITED NATIONS, February 3 -- Late on February 2, three hours after the UN Security Council ended its consultations on Syria and spoke of a blue or "final" draft resolution to be sent to capitals, Inner City Press obtained the draft and it now putting it online, here. As a non-Western diplomat told Inner City Press just after the consultations broke up, concessions were made such that now while the Council "calls for an inclusive Syrian-led political process," it is explicitly "without prejudging the outcome," in Operative Paragraph 6. The non-Western Council diplomat said that means that Bashar al Assad does not have to delegate power to his deputy, even temporarily. French Ambassador Gerard Araud on Thursday, even after agreeing to omit the original paragraphs 7a, b and c, insisted to Inner City Press that it still called for the "transfer" of power. In the Council's closed door consultations on Thursday, much time was spent insisting on the important of common interpretations, or at least common public statements and "no statements to the press." Also dropped, from the "blue" or final Operative Paragraph 16, is that the Council if it considers further measures would do so in consultations with the League of Arab States. Inner City Press was chided for having obtained and exclusively published the Version 2 draft of January 30, with track changes, and the Version 3 draft on the morning of February 2. But the "blue" draft should be seen, by the public and especially the impacted public, as quickly as possible. And so Inner City Press is putting it online, as early on February 3 as possible, New York time. Watch this site.